No Need to Carry Many Big Bottles Again when you travel. No worries that your shampoo are not allowed to bring to airline. Stay Away From the Trouble of Big Bottles, You Will Travel Easier With This Bottles. You are allowed to bring one small bag of liquids, aerosols, gels, creams and pastes through the checkpoint. These are limited to 3.4 ounces or less per container. Consolidating these containers in the small bag separate from your carry-on baggage enables TSA officers to screen them quickly. Playful Range of Combinations, while the large opening is easily refill this Lightweight packing Also, Easy to Fill and Clean. TSA Approved For Carry-On Travel Bottles. 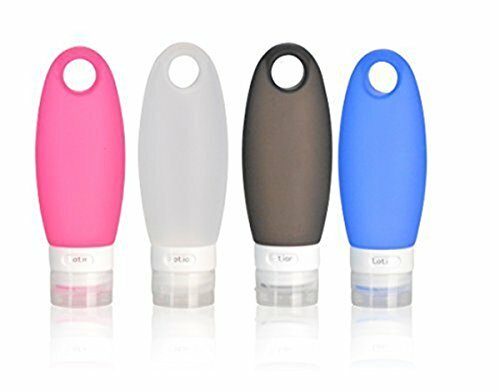 This High Quality Sillicone Toiletries Travel Bottles is Perfect for Shampoos, Conditioners, Soap, Face Wash, Lotions, Creams, etc. Our silicone travel bottle is naturally BPA free, Food Grade Silicone, FDA Approved. Can also be used for Syrups, Ketchups, Salad Dressing, etc. Perfect for Traveling, Outdoors, and much more Situations. Our silicone Travel bottles Have Multi Layer Leakage Prevention Design. The anti-drip cap has a flow valve spout that is designed to prevent leakage and spillage and to control the flow when squeezing the contents out. Flexible, Soft, and Easy to squeeze down to the last drop. Large opening allows you to easily refill your bottle. Leak Proof Technology - 3 leak-proof cap walls and no drip valve to prevent leaks and spills. Adjustable ID Window, Conveniently labeled Shampoo, Conditioner, Soap, Lotion, etc. 100% BPA Free Food Grade Silicone. STRONG SUCTION CUP for temporary hands-free usage. While they are not designed to be permanent fixtures in the bathroom, the suction provides convenience in times when you want your hands to be free, like when bathing. Carry On the Plane - Take our travel containers in your suitcase on the airplane. They meet airline and FAA standards and are perfect for your travel size toiletries. These travel inserts are great to tote around moisturizers, hand sanitizers, or other personal items in small handbags, messenger shoulder bags, and diaper bags. FDA Approved - Our travel bottles are FDA approved and made of 100% BPA-free silicone. They are completely food safe make great condiment bottles! Use them to tote small portions in a lunch bag for school or work. Fill with salad dressing, ketchup, mustard, sauce, and even use to store baby food! Goodbye Leaks -The lid of each of our bottles has 3 leak proof walls to protect your phone, camera, toothbrush, clothing, and other personal items in your bag from leaks and spills. Only when the soft, waterproof silicone body is pressed will the contents be released. Fill with toiletries like toothpaste, saline solution or contact solution without the worry of leakage! Superior, Easy-to-Use Design - Other plastic bottles are hard to fill and leak under changes in pressure. Our travel bottles are leak-proof and easy to refill. These containers also come in a clear organizer case you can easily store and find in your luggage while traveling. Can always see what you are packing with. The different colored bottles help you identify contents at-a-glance. If you have any questions about this product by RoseFlower, contact us by completing and submitting the form below. If you are looking for a specif part number, please include it with your message.